Ten years after selling the company bearing their name to Adolfo Orsi in 1937, and remaining for those ten years as employees of the company, the Maserati brothers founded Officine Specializzate Costruzioni Automobili – Fratelli Maserati SpA better known as O.S.C.A in 1947. Towards the beginning of the 1951 Grand Prix season Prince Bira had one of his three year old Maserati 4CLT/48’s fitted with a new 4.5 litre OSCA 60º V12 motor that produced 330hp to replace the regular 1.5 litre 4 cylinder supercharged motor. The Prince recorded a debut win with the new motor in the Richmond Trophy at Goodwood and raced with it on at least four further occasions scoring a best 4th in the 1951 Bordeaux Grand Prix concluding his season with a retirement from the 1951 World Drivers Championship Spanish Grand Prix after completing just 1 lap with engine failure. A little over a month before the Spanish Grand Prix O.S.C.A turned out with their own Formula One challenger, today’s featured 4500G powered by the same type of alloy block V12 as they had supplied to Bira. Franco Rol qualified 18th of the 21 starters for the 1951 Italian Grand Prix and completed all but 13 laps of the full distance to be the last classified finisher, in a career high, 9th place. 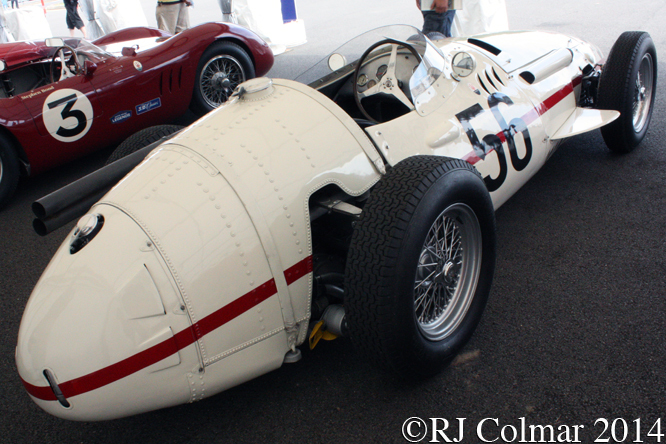 In the absence of sufficient commitment from manufacturers to continue with the 1.5 litre / 91.5 cui / supercharged / 4.5 / 274.5 cui litre normally aspirated Formula One powered cars, the 1952 and ’53 World Drivers Championships were decided by running the series for 2 litre / 122 cui Formula Two cars. 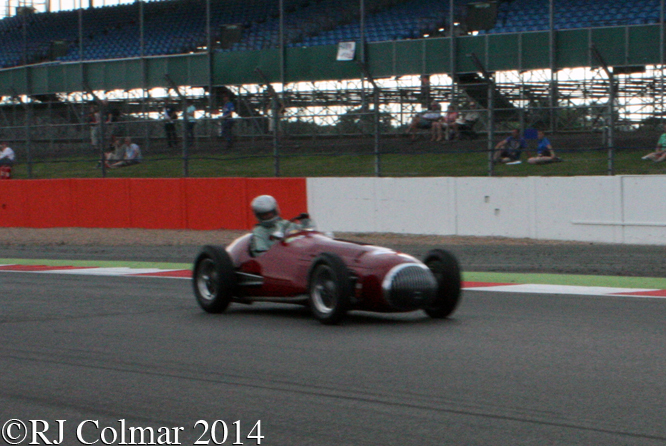 Consequently the last all new type to appear in the 1951 Formula One championship season and the only car built specifically to compete in Formula One races by the Maserati brothers remains the OSCA 4500G seen in these photographs at last years Silverstone Classic being driven by Stephan Rettenmaier. Thanks for joining me on this “Last New 4.5 Litre” edition of “Gettin’ a li’l psycho on tyres” I hope you will join me again tomorrow. Don’t forget to come back now ! 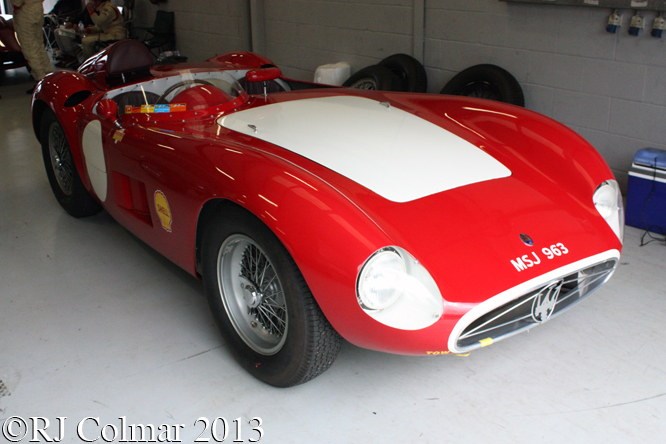 This entry was posted in Uncategorized and tagged 4500G, 4CLT48, Bira, Classic, Colmar, Formula, maserati, One, OSCA, Psychoontyres, Ralph, Rettenmaier, Rol, Silverstone on August 10, 2015 by Ralph. In the last of this series celebrating the Silverstone Classic Silver Jubilee this edition of “Gettin’ a li’l psycho on tyres” looks at five decades of Formula One cars. 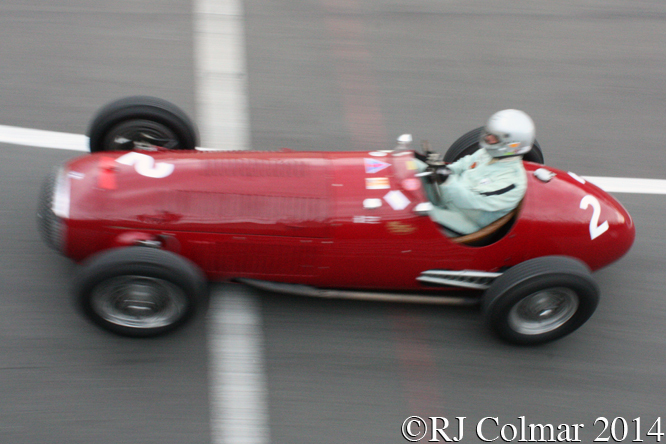 Last year one of the highlights of the Maserati Centenary Trophy was seeing Stephan Rettenmaier exercising the 1951 V12 OSCA G4500, the only purpose built Formula One car built by the Maserati brothers, as opposed to the company bearing their name. 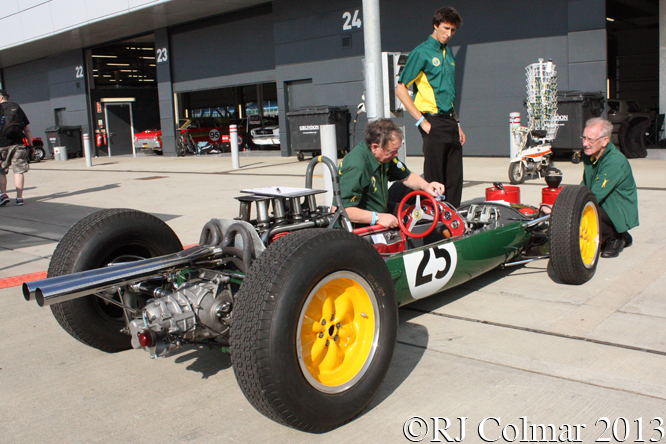 Above Bob Dance far right is seen above fettling Andy Middlehurst’s #25 Lotus 25 chassis #R4, just as he did for Jim Clark over 50 (fifty) years ago. 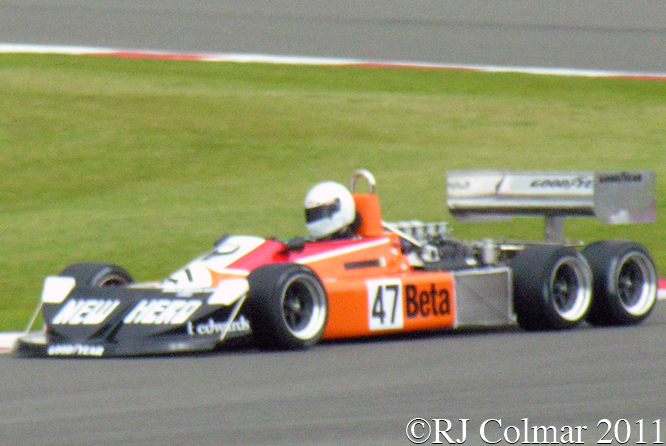 The March 761 was never raced in 2-4-0 configuration as seen above driven above by Jeremy Smith, but it probably helped nurture the interest of many a Scalextric racer into fully fledged Formula One fan. In my humble opinion a Ferrari driver should have won, a Renault driver could have one drivers championship but a well deserving Williams driver Keke Rosberg did win the 1982 Formula One Drivers championship, driving an FW08 like the one seen with Richard Eyre at the wheel above, a six wheel version of the FW08 was also tested in 1981. 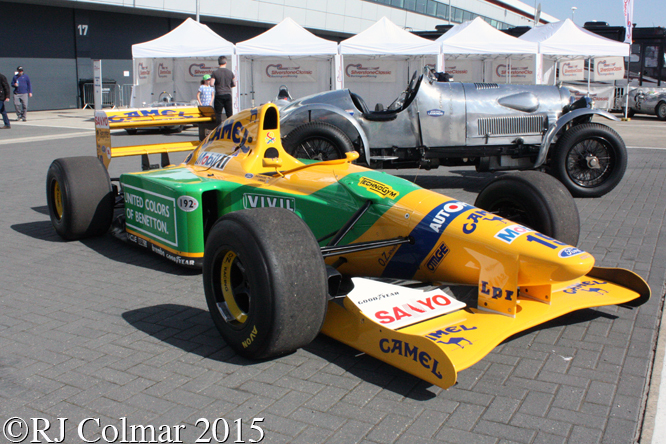 Finally this year will see the appearance of Legends of Modern Formula One demonstrations featuring cars from the 3.5 litre Formula One era like Lorina McLaughlin’s ex Micheal Schumacher championship winning Benetton B192 seen above at the Silver Jubilee Silverstone Classic Press Day. Entry to Silverstone Classic is by pre booked tickets only which are available from the website linked here. Thanks for joining me on this “Five F1 Classics” Edition of “Gettin’ a li’l psycho on tyres” I hope you will join me again tomorrow. Don’t forget to come back now. This entry was posted in Uncategorized and tagged 2-4-0, 25, B192, Benetton, Classic, Colmar, Dance, Eyre, FW08, G4500, Jubilee, Lotus, March, McLaughlin, Middlehurst, OSCA, Psychoontyres, Ralph, Rettenmaier, Rosberg, Schumacher, Silver, Silverstone, Smith, Williams on July 5, 2015 by Ralph. 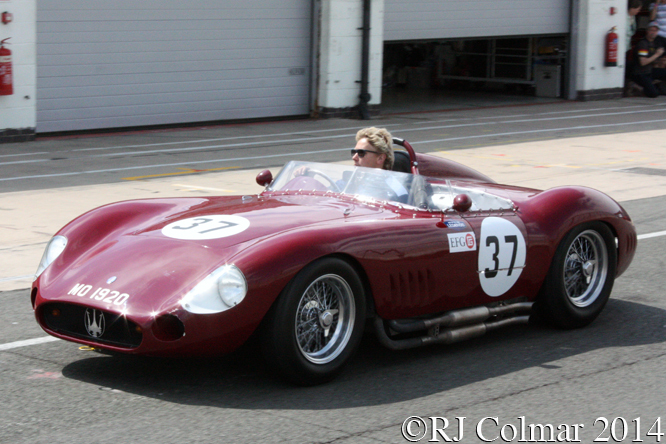 Today’s featured car the Maserati 300S chassis number #3059 was sold to Benoit Musy of Fribourg Switzerland midway through 1955. Benoit is known to have raced #3057 in at least 16 events which including a pair of maiden wins Spa and Chimay in 1955 and three more in 1956. In October 1956 Benoit was killed driving a Maserati 200S at Monthlery and two years later the car was acquired by Automovel e Touring Clube de Angola, Africa where it is known to have been entered in at least five events up until 1962. Before it’s last known in period event the motor was damaged and replaced with a Ford V8. After the 1975 Communist Revolution in Angola the car was turned into a street car but was soon left to gather dust for over a decade until it was discovered by Norwegian Stein Johnson who imported the car to Oslo in 1991. Between 1992 and 1994 #3059 was restored in the UK with a fresh motor, what remained of the original motor was repaired and fitted into chassis #3069. 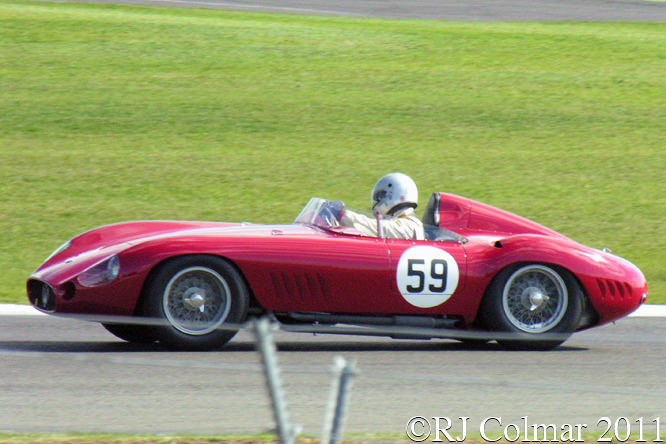 #3059 seen above at a HGPCA test day at Silverstone last year currently belongs to German Stefan Rettenmaier. 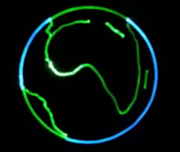 Thanks for joining me on this “Gathering African Dust” edition of “Gettin’ a li’l psycho on tyres”, I hope you will join me again tomorrow when I’ll be looking at a Bugatti. Don’t forget to come back now ! This entry was posted in Uncategorized and tagged 300S, Automovel e Touring Clube de Angola, Chimay, Colmar, GALPOT, HGPCA, Johnson, maserati, Musy, Ralph, Rettenmaier, Silverstone, Spa, Test Day on September 22, 2014 by Ralph. Last weekends Silverstone Classic included a centenary celebration of the Maserati marque and here are six of the racing cars that were part of the event. I understand only 3 cars were built by Maserati to 250S specification and that the car seen here driven by Stephen Bond may be the prototype the only one of the three to have started life as a Maserati 200S before being fitted with the larger displacement 2.5 litre / 152 cui motor. I’m fairly certain the vehicle above is a Maserati 300S but which one of the 26 built and who is in it I have yet to find out since it appears to have been a late entry, if you happen to know which car this is please do not hesitate to chime in below. One of the most interesting vehicles at Silverstone was the white Maserati 250F chassis 2521, seen above, which is as it appeared in the 1959 German film “Ein Engel auf Erden” An Angel On Earth also known as Highway to Heaven which I have never heard of before but from this youtube clip appears to be a romantic comedy set in the Cote d’Azur with Romy Schneider in the role of an angel. Christopher Wilson was driving one of two 1959 Cooper Maserati T51’s entered in the Jack Brabham Memorial Trophy for pre 1966 Grand Prix cars. 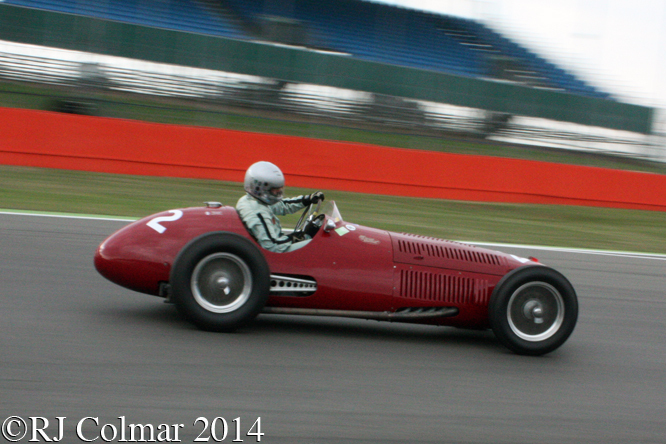 I looked at Julia de Baldanza’s fabulous Maserati A6GCM last week. 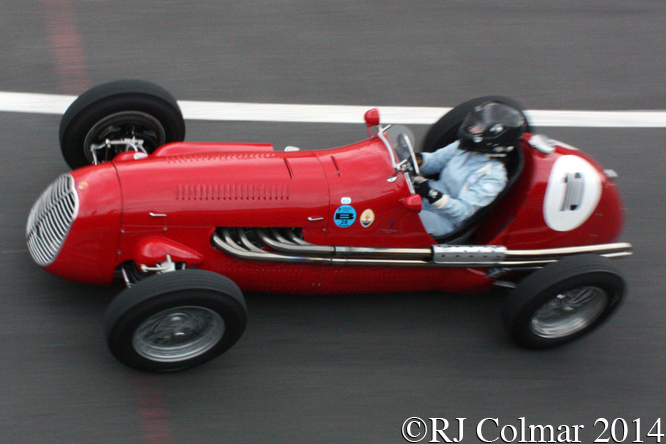 In 1947 the Maserati brothers founded Officine Specializzate Costruzioni Automobili – Fratelli Maserati SpA better known as O.S.C.A and this is their 1951 G4500 formula one challenger which is known to have raced at least once in the 1951 Italian Grand Prix where Franco Rol was classified 9th 13 laps down after starting 18th, Stephan Rettenmaier is seen at the wheel here. 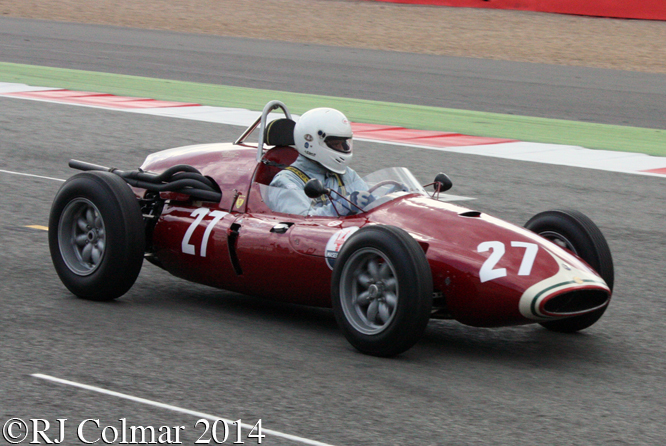 Thanks for joining me on this “Maserati Racers” edition of “Gettin’ a li’l psycho on tyres” I hope you will join me again tomorrow when I’ll be looking at some of the French Cars at Silverstone Classic. Don’t forget to come back now ! 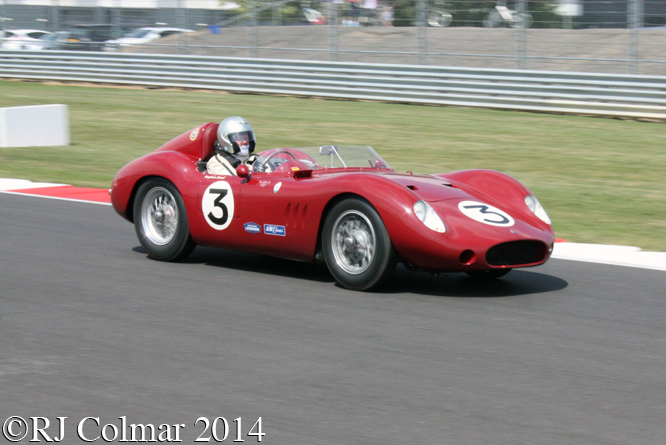 This entry was posted in Uncategorized and tagged 250F, 250S, 300S, A6GCM, Bond, Colmar, Cooper, de Baldanza, Ein Engel Auf Erden, G4500, GALPOT, OSCA, Ralph, Rettenmaier, Schneider, Silverstone Classic, T51, Wilson on August 4, 2014 by Ralph. 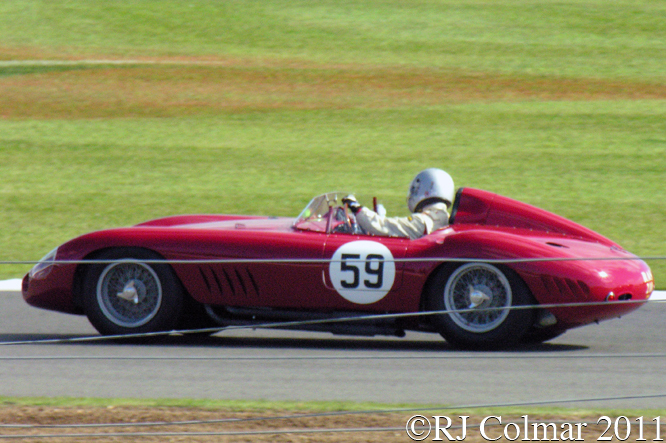 Carrying the #15 on the 1955 Le Mans entry list, one spot below Mike Sparken’s #14 Ferrari 750 Monza chassis 0504M which I looked at some time ago, was today’s featured Maserati 300S chassis #3054 which was to be driven by Roberto Mieres and Cesare Perdisa two weeks after the car had been driven to victory at Monza by Luigi Musso and Jean Behra. 24 laps into the race #3054 was running in second place overall when it retired with a gearbox problem giving the drivers an unwelcome early night. Ironically this occurred 1 lap after the #14 Ferrari had retired with a broken motor. A second Maserati 300S #3055, driven by Luigi Musso and Luigi Valenzano lasted 239 laps before it’s gearbox also failed making it the last car to retire from the 24 hour classic. From it’s first four starts, by a 2 litre A 6GS in ’54 another in ’55 along side the two 3 litre cars, in the Le Mans 24 Hours Maserati had yet to record a single finish. With it’s gearbox repaired Jean Behra drove #3054 two weeks later to victory in the 1955 Portuguese Grand Prix and at the end of 1955 Juan Manuel Fangio drove #3054 to victory in the first Venezuelan Grand Prix. For 1956 the #3054 was fitted with a long nose body and the car was taken to Buenos Aires where Stirling Moss and Carlos Menditeguy drove her to victory in the 1000km race. Piero Taruffi and Jean Behra then drove #3054 to 5th overall and 1st in class in Sebring 12 Hours. Carlos Menditeguy teamed up with Jean Behra to drive #3054 in the 1957 1000kms race at Buenos Aires finishing second but 1st in class. The #3054 was subsequently sold to Venezuelan Escuderia Sorocaima and the known results during his ownership include a 22 overall and 3rd in class finish in the 1962 3 hour Daytona race with Guido Lollobrigida at the wheel. After Daytona Charlie Kolb bought the car and recorded 2nd place finishes with it at Fernandina Beach and Marlboro before going one better to record a win at Savanah which appears to be the last recorded in period outing for #3054. 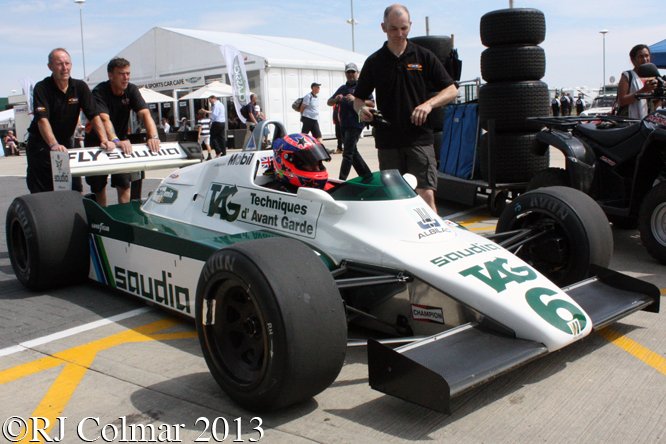 The car is seen in these photo’s at the Silverstone Classic with Stephan Rettenmaier at the wheel. Thanks for joining me on this “Unwelcome Early Night” edition of “Gettin’ A L’il Psycho On Tyres”, I hope you will join me again tomorrow for a look at the first Le Mans winning Bugatti. Don’t forget to come back now ! This entry was posted in Uncategorized and tagged 300S, Behra, Colmar, Fangio, GALPOT, Kolb, Lollobrigida, maserati, Menditeguy, Mieres, Moss, Musso, Perdisa, Ralph, Rettenmaier, Silverstone Classic, Sorocaima, Taruffi on June 2, 2014 by Ralph.